Send an email to help@ductmail.com - we'll take it from there. Send an email to reminder@ductmail.com. Then in the subject line, include when you want to be reminded, such as "today at 5PM" or "tomorrow at 3PM", or even "next saturday at 10:00 AM". Then, in the body of the email, just include what you want us to remind you with, and that's it! Just a heads up, but we are still in alpha stages. Yes, things are mostly working, but they aren't working as well as we want them yet. Stay tuned! 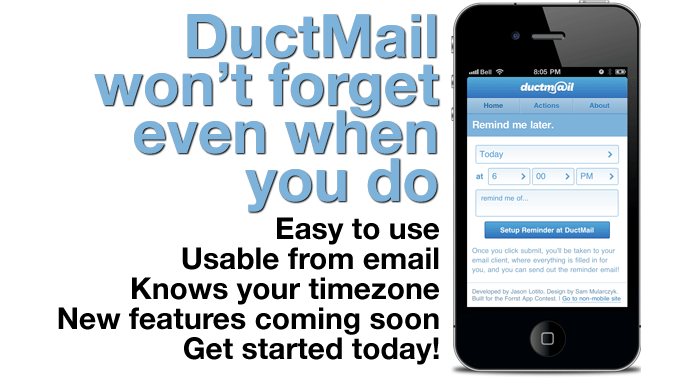 Out and about and need a quick reminder on how to use DuctMail? Just send an email to help@ductmail.com and we'll get back to you right away. Have you ever asked someone to remind you later? Well, DuctMail is that person! Except, it will actually remind you later with an email sent to you when you want it. Built for the Forrst App Contest.